Douglas Showalter is a professional guitarist/songwriter/producer based in Nashville. He took to the guitar at an early age and studied at the Musicians Institute in Los Angeles, where he was mentored by many great guitarists like Dean Brown (Marcus Miller, Billy Cobham), Jean Marc-Belkadi and Takeshi Akimoto (Ziggy Marley, Jimmy Kimmel Show) among others. Douglas is well versed in the languages of jazz, rock, R&B, funk, and down- tempo electronica. His versatility lends itself to teaching a wide variety of songs, as well as Artist Studies, soloing, chords and rhythm, and new age guitar. Douglas will show you a single guitar approach teaching you many of the melodies and licks played in a funky style, along with some chords that you can play during the chorus. In these eleven lessons, Douglas Showalter will teach you the parts to "All You Wanted", by Michelle Branch. Douglas will be using a capo at the first fret, and will start with the electric clean picking parts and lead licks in the three verses and the overdriven parts in the chorus section. Then we'll break down the bridge, a lead melody, and the ending of the song. Then it's time to play along with Douglas through the song, and finally take center stage and play it yourself with the "band". This song tutorial is about the song "Backwater", by The Meat Puppets. This mid-90s alt rock/grunge hit is easy to play, yet has some interesting twists. We'll examine the form of the song, the different chords (major, minor, sus2, power), the energy and vibe of the song, the solos, and then you can play along with me, then take over in our jam along. - This song features tons of cool guitar parts, tones and techniques. These include some cool uses of 7th chords with a clean tone, some slide guitar melodies, a wall of heavy rhythm guitar, along with several additional colors using some effects. I'm going to break down how to play all these different parts and techniques, and at the end we will put it all together with a backing track. After we have heard the song as a full play-a-long, I will then do another pass of the song just using Guitar #1 for a single guitar performance. "Black Horse and The Cherry Tree" is a hit from the mid 2000s, made famous by KT Tunstall. This high energy but simple track features some really cool rhythm guitar techniques and percussive tricks you can do on the acoustic. The verses are just 2 chords that use a Bo Diddley type of N'awlins "second line" groove along with the percussive techniques to drive the song, while the choruses are just three simple, familiar chords played in a typical strumming pattern. I'll show you how to play the percussive techniques that really propel the song in the verses, the chords and strumming, and finish with a play along. Douglas will show you how to play the piano intro on guitar, the guitar parts from the record while employing some barre chord shapes, and the 12 string guitar solo. He'll also show you an easy chord version! In this set of metal lessons, Douglas Showalter is going to teach "Click Click Boom", by Saliva. After a song introduction and a look at gear and tone, we'll dive right into the main riff; the the 2 guitars in the verses. We'll follow that up with the chorus parts, then learn the cool bridge of the song. We'll break down the outro before we do play along performances, then you'll take over in the jam along. In this series of lessons, Douglas Showalter will teach you "Closer", by Kings of Leon. First we'll take a glance at the song as a whole, then look at the gear, tone, and effects. Douglas will teach the pitch-shift bass part on guitar, then how to emulate the "pickup yells" on guitar. Following that you'll learn the barre chords, the single string melody, then the arpeggiated chord melody. We'll conclude with a play along and a jam along. In these lessons Douglas Showalter will teach you "Crawl", by Kings of Leon. After a song introduction and talking about the gear and tones, you'll learn the intro effects that open the song. Next up is the main riff motif; then we'll break down the A and B section parts. Then we're on to the wild solo, and we'll conclude with a full and single guitar performance and a "guitar karaoke" jam along. In this set of lessons, Douglas Showalter will teach "Creep", by Stone Temple Pilots. First up is a song introduction and a look at the acoustic and electric gear and tones. You'll learn the intro parts before moving to the verse strumming and arpeggiations, then we'll break down the pre-chorus and chorus. We'll peek at the song's bridge, then do full and single guitar play along performances, then the jam along. Douglas will show you this classic tune featuring all those unforgettable melodies and hooks that have made this song a long lasting hit, and guiding it along is a single guitar part that is both fun and easy to play. There are some harmonics, some cool arpeggios, along with some moving chords during the choruses. Douglas will show you how to play the single acoustic guitar approached for this modern country anthem. In this song tutorial, Doug Showalter will teach you "Dog & Butterfly", by Heart. Starting with a synopsis of the lessons and a look at the acoustic tone, we'll then learn the motif and verses of the song, then dig into the pre-chorus part. That leads us to the chorus and its variations, then we'll learn the bridge section. You'll do a play along performance next, then end with the jam along. In this song tutorial we're going to lay back and relax, and learn the parts of the soft jazz pop song "Don't Know Why" as made famous by Norah Jones. We'll be using a capo on the 6th fret, and learning the jazz chords in the verses and choruses, with the resolutions and turnarounds. At the end you can play along with a backing track, with vocals that mark the track for you. In this tutorial we are going to learn how to play "Dust in the Wind" as made famous by Kansas. We'll focus on the musical elements that have made this song a long standing classic, by way of teaching you the acclaimed acoustic guitar parts and violin solo. We will break down the tutorial into 5 video lessons. 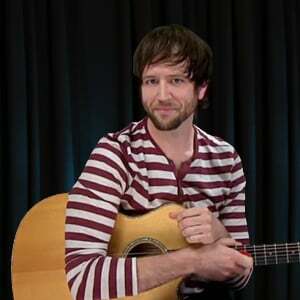 In this song tutorial, Douglas Showalter will teach you "Everything", by Lifehouse. After a song introduction and a look at the tones and effects, you'll learn the song intro and the three varying verses, along with the interlude. You'll also learn the three differing choruses in the tune, plus the high-dynamic bridge, and the acoustic ending. We'll conclude with a play along, then a "guitar karaoke" jam along. In these eleven lessons, Douglas Showalter will present you with all the elements to "Face Down", as made famous by The Red Jumpsuit Apparatus. There's quite few sections to this song, and Douglas will go through the intro guitars, the first verse, the chorus, and the short interlude. Then he'll delve into the second verse, and the bridge in two parts. After that, he'll break down the double chorus, and the outro. Finally, we'll do a play along performance then a jam along. In this set of metal lessons, Doug Showalter will teach "Falling Away From Me", by Korn. After a song introduction and the gear and tones, we'll look at the main melody, then the main riff. The verse and chorus parts are up next, then the break down of the bridge. We'll do a full performance play along and a single guitar performance, then conclude with a jam along. In this set of lessons, Douglas Showalter will teach you "Falls On Me", by Fuel. First off is an overview of the song, then a look at gear and tones. Douglas will then get into the arpeggiated song intro, then teach the choruses and the post-chorus interlude. We'll then step into the 2nd verse and the bridge section, followed by the 4th chorus variation and the outro. Last we'll learn the song ending, then do a play along and a jam along. Douglas will show you all the guitar parts of this song from the arpeggiated chords, to the powerful hook, to the electric guitar parts. In these lessons, Douglas Showalter will teach "Fell On Black Days", by Soundgarden. After a song synopsis and the gear and tones, Doug will teach the intro of the song, then dissect the main verse riff. We'll learn the verse 2 lick before we do the choruses; then we'll break down the bridge. The solo rhythm and the solo are next, then the final chorus octaves and the outro lick. We'll end with full and single guitar performances, then a jam along. In this tutorial, Douglas Showalter will teach "Fly", by Sugar Ray. Douglas will give an overview of the song then talk about the gear and tone. We'll take on the main melody before we learn the verse, then we'll dig into the chorus. The post-chorus hook is next, then we'll learn the bridge and the interlude before we learn the song outro. We'll end with full and single guitar performances, then you'll play the song by yourself in the jam along. This lesson is about the techniques and chords used in "Follow" as made famous by Richie Havens. Played in open D tuning, this great singer/songwriter track is played fairly loose and with lots of feeling. We'll look at the rhythmic strumming approaches here on acoustic, the electric guitar melody, and the use of harmonics and embellishments. We'll end with a full song performance. In this tutorial Douglas Showalter will teach "Four Rusted Horses", as made famous by Marilyn Manson. After starting with a song introduction and the gear and tone, we'll break down the main acoustic riff for you. We'll follow that with the acoustic pre-chorus - then the chorus - before we learn the single note electric line in the chorus. We'll tie it all up with full and single guitar performances, then you'll take over in the jam along. In this tutorial we are going to learn how to play "Funny How Time Slips Away" as performed by Willie Nelson. This classic song features a simple chord progression. using two guitars, that has stood the test of time as a songwriting staple. In this series of lessons, Douglas Showalter will be taking you through the song "Gives You Hell", by The All-American Rejects. Douglas will be teaching you the keyboard parts on guitar here, as well as the guitar parts for the verses, pre-chorus, chorus, and bridge. You'll play along through the entire song in the performance lesson, then be the lone guitar player jamming along with the backing track. Douglas will show you how to play this beautiful acoustic track with a great groove, and an easy chord progression that is fun to play and features Taylor's signature finger picking. In these 12 videos, Douglas Showalter will be breaking down the parts to "Hanging by a Moment", by Lifehouse. After the tones and tuning, we'll get right into the signature riff that occurs throughout the song, then 1st chorus. Next up is the harmonics followed by chorus 2, and the bridge in two parts. We'll break down the interlude and verse 3 after that, then the song ending. You'll play along with Douglas, then take over in the jam along. In this set of lessons, Douglas Showalter will teach "Have a Little Faith in Me", by John Hiatt. Doug will introduce the song and talk a bit about gear and tone, then break down the verse part for you, adapted from the piano. Next up is the descending chord progression in the chorus followed by the modulation towards the end as the song rides out; then the song's ending. We'll conclude with a play along, then you'll take over in the jam along. In this series of lessons, you'll learn the parts to the searing metal song "Headstrong" by Trapt. Douglas Showalter takes you through the signature guitar hook, the verses, the elements of the chorus, the bridge, and then plays through the whole song. We also look at Drop C tuning, as this song was originally played on a 7-string guitar and since most people don't have a 7-string, we'll teach it to you on a regular 6-string. Here's a super fun uptempo song: "Here In Your Bedroom", by Goldfinger. Douglas Showalter will teach you this one; the song intro with its ensemble licks, the ska rhythms, the distorted power chord parts in the pre-choruses and choruses, and the song outro and ending. To finish things off we'll do a full performance play-along, then you jam along with the backing track. In this series of nine lessons, Douglas Showalter will teach you the song "I Don't Care", as made famous by Fall Out Boy. Douglas will guide you through the main riff; the verses, choruses, and bridge; the solo; and the groove. He'll give everything a final polish with a full performance play-along so you can put it all together, the it's time to play the song on your own to the jam track. In this set of lessons, Doug Showalter will teach "I Fought the Law", as made famous by The Clash. We'll introduce the song and talk about gear and tone, then break down the main motif. We'll then detail the A section and B section of the song before we look at the bridge rhythm and lead parts. We'll take a quick peek at the song ending, then do full and single guitar performances and a jam along. Got your big seagull-wave hairdo all sculpted? Okay then, it's time to learn the 80s new wave classic "I Ran", by Flock of Seagulls. We'll take you through the delay settings, the simple yet effective verse lick, the chords for the verse and choruses, the solos, and play it all through to a backing track. Douglas will show you how to cover this song using two guitar parts by combining rhythm guitar parts and lead lines into one guitar, as well as all the backbeat hits with another. Both of these guitars give you the necessary tools to play along with this awesome song, combined with a way that works great just for two guitars. This series of song lessons examines the 90s alt rock tune "I Walk Alone" by Oleander. We'll break down the chords and form, rhythms, pentatonic bends and swells, and get our groove on by jamming with the full backing track at the end. To cap it all off, you'll jam along by yourself! In this tutorial we are going to take a look at how to play "Testify" as made famous by Parliament. This track features some great funk licks and in this video, I will show you how to play some of the clavinet parts as well. Let's check it out! In this set of twelve lessons, Douglas Showalter will lay out all the parts to "I Will Buy You A New Life", as made famous by Everclear. This one has multiple guitars, and you'll learn what each one plays in the A, B, and C sections of the song. The we'll look at the song ending, followed by a play-along performance. In this set of nine lessons, Douglas Showalter will teach "I Will Follow You Into the Dark', as made famous by Death Cab for Cutie. After a song introduction and a bit about the acoustic tone, we'll look into the song intro and strumming. Following that we'll break down the first verse and chorus parts, then the last verse and chorus. To conclude we'll do a play along, then a jam along. In this tutorial, Doug Showalter will teach "It's Time", by Imagine Dragons. We'll introduce the tune then talk about gear and tone, then learn the intro melody adapted to guitar. Next is guitar 2 in the 1st verse and chorus, then the interlude/second verse before we learn the bridge parts. We'll return to the choruses for a couple of parts, then learn the outro. We'll conclude with full and single guitar performances, then a jam along. In this tutorial we are going to take a look at how to play the late 60's funk classic "It's Your Thing" by The Isley Brothers. We'll to teach you both guitar parts, and we are also going to take a look at how the guitar fits into the whole arrangement by soloing it against each instrument. Remember it's not about how much you play, but how tight your groove is and how you fit into the big picture. Let's groove! In this tutorial Doug Showalter will teach "Jesus Christ Pose", as made famous by Soundgarden. Doug will go over the song and the gear and tones, then teach the feedback intro. The main riff on both guitars is up next, then verse 1; the licks for guitar 2 follow. We'll break down the pre-chorus and chorus after that, then take on the bridge before we do full and single guitar performances and finish with a jam along. In this series of lessons, Doug Showalter will teach "Just the Way You Are", by Billy Joel. After an overview of the song and a peek at the acoustic tones, we'll break down the main motif of the tune. The A section is up next - done in two different rhythm styles - followed by the B section, which is also presented in two styles. We'll detail the C section, then the outro, before we do a play along performance and a jam along. Douglas will show you how to play this country song with some easy open chords with a single acoustic guitar, and how to play the main melody of the song on a second acoustic guitar. In these lessons Douglas Showalter will teach you the new wave hit "Let's Go", by The Cars. Douglas will introduce the song and discuss gear and tone, then dig right in to the intro section. We'll then break down the verse parts, and the pre-chorus, before we take on the chorus. Next is the post-chorus melody, then the song's outro. We'll finish with full and single guitar performances, then a jam along. In this song tutorial, Douglas Showalter will teach you the parts to "Lifestyles of the Rich and Famous", as made famous by Good Charlotte in the early 2000's. You'll learn the verses and the variations thereof, the pre-chorus and main chorus, the second pre-chorus, the bridge, the final chorus, and the crescendo ending. Then we'll do a performance play along, then a jam along. In this set of song lessons, Douglas Showalter will teach you "Love Is On The Way", by Saigon Kick. Doug will introduce the song and talk about the acoustic nylon string tones, the break down the main motif that occurs throughout the song. After that, we'll look at the chorus and bridge parts and the arpeggiated picking; then it's on to the solo. We'll conclude with full and single guitar performances, then a jam along where you take over. In this set of lessons, Douglas Showalter will teach you "Low", by Cracker. Doug will talk about what you'll learn in the lessons then a bit about gear and tone before laying out the chords and acoustic strumming. The electric motif is next followed by the verse leads, then we'll learn the chorus. The solo comes next, then we'll do a full performance, a single guitar performance, and a jam along. In this set of song lessons, Douglas Showalter will teach "Low Rider", by War. Douglas will introduce the song and talk a bit about gear and tones for you, then dig in to the main funk guitar line that occurs throughout the song. Next we'll break down the signature melody that is so much a part of this song, then teach you the bass groove as a bonus, for more funk. We'll end with full and single guitar performances, and a jam along. This song features lots of really cool and heavy guitar parts that are easy to play. There are two guitar parts to learn with some cool riffing and crazy noises with your pick scraping the strings, some very industrial sounding distortion using single notes and power chords being doubled by both guitars, some really cool filter/synth type tones on guitar, along with an ending guitar solo that is equal parts simple and eerie. In this set of lessons, Douglas Showalter will teach you "Moonshadow", as made famous by Cat Stevens. Doug will give an overview of the song then talk about the acoustic tone and picking; then he'll leap into the intro part and the A-section. Next up is the B-section of the song, followed by the half-time feel of the C-section. After learning the outro, you'll do a play along performance, then play by yourself in the jam along. Douglas will show you all the chords and sections to this song that features a lot of dynamic changes to follow the lyric story line. In these lessons, Doug Showalter will teach "Movin' Out (Anthony's Song)", by Billy Joel. We'll start with a song overview and the gear and tone, then it's time to learn the dropped D riff followed by the ska-ish chords and rhythm. We'll break down the pre-chorus parts next, which will lead us to the chorus. We'll learn the harmonized guitars in the outro before we do full and single guitar performances, then you'll take over in the jam along. In this series of lessons, Douglas Showalter will teach you "On Call", by Kings of Leon. We'll start with the usual overview and gear and tones, then look at the guitar intro. Next up are the 3 choruses in one lesson, followed by the second verse. The solo is next, taught in two parts; then we'll do a full performance, and single guitar performance, and finish with a jam along. Douglas will show you how to play a version of this song which features a single guitar playing rhythm guitar throughout, along with a second guitar playing the guitar solo. Douglas will show you how to play this song using a single, acoustic guitar approach. This makes it so you can easily play along with the tutorial, and with the original recording. There are two acoustics in the song, and I have taken the main parts from both and combined them into one for us to learn. We have some electric guitars in the backing track to make it more like the original as well. In this song tutorial, Douglas Showalter will be teaching you "Runaway Train", by Soul Asylum. First off is an overview, then a look at the gear and tones. Then we'll break down the intro and the first couple of verses; the pre-chorus; the chorus; and the bridge. Next, Douglas will get into the final verse, and the outro of the song. For the finale we'll do a full performance play-along, then mute the guitars so you can play by yourself with the backing track. Douglas will show you this new wave classic featuring lots of cool guitar parts and textures that give you a great representation of some of the guitar sounds heard in the early 80's. These include some funky, minor pentatonic licks, textured guitars with lots and lots of reverb, some cool guitar counterpoint, as well some ringing harmonics with a whammy bar and some effects. In these lessons, Douglas Showalter will teach "So Lonely", as made famous by The Police. Doug will introduce the song and talk about gear and tone, then teach the first verse rhythms and licks, then the 1st chorus. We'll move on to verse and chorus 2, then learn the rhythm under the solo. The solo is next in two parts; then we'll look at the outro choruses and the bridge. We'll end with full and single guitar performances, and a jam along. In this tutorial, Douglas Showalter will teach "Society", as made famous by Eddie Vedder. After introducing the song and a quick look at the acoustic tone, Doug will teach the intro. This will lead us into the verse strumming and chords, then to the chorus part; we'll then break down the rhythm under the solo and the solo itself. We'll learn the outro before we do full and single guitar performances, then you'll take over in the jam along. In this tutorial Douglas Showalter will show you how to play "Sold Me Down The River" as performed by The Alarm. This song features a single electric guitar in drop D tuning, using a biting tone with plenty of overdrive, compression and reverb. This guitar carries the song, playing a mixture of strong melodies, call and response licks, along with a really cool solo. In this set of lessons, Doug Showalter will teach "Spoonman", by Soundgarden. After introducing the song and talking about gear and tone, we'll dive into the kickin' signature riff of the song. Next we'll explore the rhythm elements in the verse, chorus, and pre-solo, then detail the guitar solo. We'll learn the bridge and the outro before doing full and single guitar performances, then a jam along to conclude. "Stellar" is a seriously cool song made famous by Incubus, with lots of intriguing tones, colors, and rhythmic movement. Douglas Showalter will teach you everything here, talking about the tones and use of effects as he moves through the lessons. You'll learn the bending and sliding in the verse, setting up the vibe of the song; the the simple four bar pre-chorus with distortion; the powerful progressive rock choruses using an octave pedal; the interlude with reverb and phaser; the bridge; and the ending with a bang! As always, we'll perform the whole song through with the "band". This set of lessons takes a look at the song Still in Hollywood, as made famous by Concrete Blonde. This is a fairly simple song, but it seriously rocks and has loads of punk energy. You'll learn the form, the power chords and punk vibe, the hooks, the use of the whammy bar, a play along, and a jam track to cap it off. Sugar We're Goin' Down is a pop-punk anthem made famous by Fall Out Boy in 2005. This tune is raw and hard-hitting yet melodic. You'll learn the verses and choruses, pre-choruses, change-ups in the song, what the two guitars are doing, and cap it off with a jam to the backing track. We're goin' down! In this tutorial we're going to show you how to play the song "Surrender" as made famous by Cheap Trick in the late 1970's. Both a live and studio recording success for the band, "Surrender" continues it's success today by it's extensive use in TV shows, movies, and video games. Douglas Showalter is going to cover how to play all the rhythm guitar tracks as well as giving you a chance to work through each section before playing the full play-along at the end. In this tutorial we are going to learn how to play "Suspicious Minds" as performed by Elvis Presley. This classic track features an up tempo feel that changes halfway through, and then comes back up for a huge outro that fades out the track. At the center of the song, guiding the whole track, is a telecaster electric guitar using a variety of cool techniques with a simple clean tone. These include some hybrid picking, some steady rhythm playing during the choruses, and strong, rhythm guitar playing on the back beat in 6/8 time along with arpeggios during the bridge. "Sweet Thing" is a signature soul classic, made famous by Chaka Khan and Rufus. This song features some very cool guitar parts that are heard all over in R&B and funk music. There are also some really cool moments where two guitars are played together to play rhythms that always seem to fit right into the groove. You'll learn the signature lick that is stated throughout the song, the guitar parts in the verses, the chorus with its chord licks and rhythm changes,and the fade out ending. Keep it funky! In these song lessons we'll investigate "Swing, Swing" as made famous by The All-American Rejects. Douglas Showalter will swing you through the parts to this pop-rock song, showing you the chords, the intro in two parts, the verse, pre-chorus, and chorus. Then he'll go into the solo, the bridge, and the harmonized guitars, and do a full performance play along for the finale. Douglas will show you all the great and varied guitar parts in this song and how to get those tones, plus a way you can play through the whole song with an acoustic guitar. In this tutorial we're going to learn the pop-punk rock song "The Anthem", as made famous by Good Charlotte. Douglas Showalter will take you through the intro and interlude sections, the verses, the pre-chorus and chorus, the bridge of the tune, and the ending. He'll also teach you the effected guitar part in the song, and cap it all off with a play along performance. Douglas will show you all the cool guitar parts, played by two distorted guitars throughout the song. There's heavy palm muting, playing in 7/8 time, plenty of chromaticism, as well as some really cool chords and melodies utilizing a interesting altered tuning. In this set of lessons, Douglas Showalter will teach you "Unwell", as made famous by Matchbox Twenty. After a song overview and a look at the gear and tones, we'll get into the intro and outro of the song. Next up is the 1st pre-chorus followed by the chorus; then on to the second verse and pre-chorus. Douglas will teach the bridge before moving on to the full performance. We'll do a single guitar performance, then it's time for the jam along. In these 13 guitar lessons, Douglas Showalter will teach you "Walking Disaster", as made famous by Sum 41. After giving you a song over view and a look at the gear and tones, we'll get into the slower tempo A and B sections. Next up are the fast-tempo parts: the lead-in, the verses, the pre-chorus, and the chorus. After that you'll learn the bridge and the interlude before we do a play along performance. Then you'll take over in the jam along, and perform the song by yourself. Douglas will show you the power of a simple chord progression mixed with great story telling. This tutorial takes the original song parts played on piano and applies it to guitar so you can play along with the original recording, the backing track in this tutorial, or on your own solo as a single guitar performance. In this song tutorial Douglas Showalter will take a look at all the parts in the pop rock song "Welcome To My Life", recorded by Simple Plan. Douglas will talk about the gear and tone, and teach you the opening acoustic and electric parts followed by the first verse. Then he'll delve into the pre-chorus and chorus, along with the second verse and pre-chorus. There's no solo i this one, so you'll next learn the bridge, the final double chorus, and the ending to the song. We'll put it all together in a final play-along performance. In these lessons, Doug Showalter will take you through the acoustic hip hop song "What It's Like", recorded and performed by Everlast. This centers around an easy chord progression on acoustic guitar, and Doug will teach you the intro and bridge approaches, the verse and chorus changes, a sliding chord riff during a brief breakdown, and the outro chords and the electric guitar solo that goes over them, taking the song out. Then we'll play the song through in a play along, and then you'll jam to the backing track. In these lessons we'll be learning the power-pop punk song "What's My Age Again?" as made famous by Blink-182. Douglas Showalter will take you through the main arpeggiated guitar riff in the verse, the second verse, the elements of the choruses and how they change up, the instrumental bridge section, the outro variation and ending, plus a full play along to get you putting it all together and performing the song. In these lessons, Douglas Showalter will teach you "Wide Open Spaces", by The Dixie Chicks. Douglas will introduce the song and talk about the gear and tones, then break down the song intro. Verses 1 and 2 are next up, then the chorus parts; then we'll look at verse 3. Lesson seven breaks down the solo section, after which we'll examine the final verse and the outro. We'll conclude with a full performance, a single guitar performance, and a jam along. In this tutorial we are going to check out how to lay down the modern day pop-punk song "With Me" as made famous by Sum 41. This song is a great example of modern production techniques with layers of different guitars and sounds. Let's check out how everything fits together. In this song tutorial, Douglas Showlater will be teachng all the parts to "Word Up", as made famous in a cover version by Korn. Douglas will take you through the song intro, the verse guitars, the chorus guitars, and the bridge guitars too, then show you the simple solo. We'll end with a play along, then mute the guitar so you can jam along by yourself. In this song tutorial, Douglas Showalter will teach you "You Are a Tourist", as made famous by Death Cab for Cutie. First off is a song introduction then a look at gear and tones; then you'll learn the main melody followed by guitar 2's octave melody line. Next we're into the chord arpeggio picking parts for both guitars in the A section, then the B section. We'll break down the countermelody line, then move on to the full and single guitar performances, and finish with a jam along. In these ten guitar lessons, Doug Showalter will teach "You May Be Right", by Billy Joel. After a song overview and a peek at the gear and tone, Doug will guide you through the main motif of the song. We'll learn verses 1 and 2 next, then the chorus with its stop rhythms and licks. Next up is the guitar solo, then we'll do a full performance, a single guitar performance, and a jam along. In the world of rock rhythm guitar, there exists a wide variety of alternatives to your every day major and minor chords. While these chords certainly serve their purpose, it is essential to also seek out the wide array of chord alternatives available to rock guitarists. Putting variation on barre chords, power chords, and open string chords; the examples below will introduce you to this never ending world of exploration on your instrument. We will also look at how adding distortion to your already existing bar chords can also bring these shapes to new heights. Seeking sounds from Lenny Kravitz, The Police, System of a Down and more, this chapter will broaden your expectations of what your already existing chords can become. In rock rhythm guitar, simple chords can often be played with slight variation to create what is called chord embellishment. The idea behind chord embellishment is taking any chord in your vocabulary and adding a slight variation to one or two of the notes you are playing to create a strong rhythm. With this idea, you also develop a strong melody on top of the chords you are playing. This technique is used by everyone from Chuck Berry to Led Zeppelin to Stone Temple Pilots to The Killers and just about any contributor to the rock guitar world. The following examples showcase ideas and concepts that introduce you to this idea. Each example touches on a different style and era of rock guitar, allowing you to see how simple chords can develop strong movement with just a small amount of variation. As just an added bonus to our already strong Lead Guitar Elements section, we are going to conclude this tutorial by looking at the use of intervals in the major and minor scales. We have taken an in depth look at many different ways to explore each of these scales. An important factor to realize is that within each scale resides a series of intervals that can be played together within a rock guitar solo. Each interval has a completely different sound and while some may sound harmonic and pleasing, others may resonate at odd frequencies and sound dissonant. Our focus in this chapter are the more melodic intervals in the major scale; those being thirds, fourths, fifths, and sixths. Our goal today is to give an introduction to the sound of these intervals and give you some unique examples in the styles of artists you know to get you started with this concept. We are going to demonstrate how to play the intervals in each example using scale patterns we learned in previous chapters. While the notes in a major scale sound great when played in a specific way, there are certain notes that have to be carefully placed to work within the harmony. The Major Pentatonic Scale works to remedy this situation by eliminating two of the notes from the major, enabling every note to sound harmonically "in the right place." While stylistically this may or may not sound particularly innovative, the fact remains that these 5 notes sit almost perfectly inside their major key and create a foundation to work from when exploring rock soloing. "Penta" meaning five, and "tonic," meaning note; come together to name this scale. Here is a breakdown of the scale stemming from our previous graph. In our final installment of Rock Guitar Level 2: Chords and Rhythm, we are going to look at the idea of Rhythm, Time and Feel. Rhythm is the basic foundation for the all music we know and love. It is what all instruments unite within to work together to produce musical ideas. We have the ability to count rhythm by applying the concept of time signatures. This firms our foundation by allowing us to have a set repetition of numbers to play our music within. And lastly, how we go about playing such rhythms in their respected time signatures is dictated by the feel we are going for. The feel is the overall feeling we put into our rhythm guitar parts, applying either a straight, shuffle, or swing feel. These three feels cover the majority of rock music that we have grown to know and love. In our lessons today, we are going to look at a few different time signatures and how to count them, along with examining different feels we can apply to our rock rhythm guitar. It is essential to play all of these examples with your metronome, whether that be the one provided by Guitar Tricks or your own personal one. In this section of Rock Guitar Level 2, we will focus on the concept of Major Triads and their inversions. A triad is a chord using 3 notes to create one overall sound. In many of the major chords you have previously learned from Guitar Tricks, their already exists triads in your musical vocabulary. Each chord we reference will have three major triads, and each of these triads is called an inversion. While each example in the lessons will have different shapes, each of them still remains the same chord. We will use the triads you already know, demonstrating their inversions from a D major chord, an A major chord, and an E major chord. We will take each lesson using string groups of three, and will follow each explanation with an example of those triads use in the rock guitar world. We are going to shift our attention to the concept of minor chords and their inversions. Again, a triad is a chord using 3 notes to create one overall sound. Now matter what the shape, these chords all include the same notes and will create the same quality of sound. Shifting from major to minor, the only difference between minor triads and the major triads we learned in Chapter 1 is the lowering of one note, a half step (or one fret down the neck of the guitar.) We will again use triads you are already playing in the chords D minor, A minor, and E minor, also using the string grouping concept. Following each demonstration will be more examples of triads used in a rock guitar style.